The designation is part of a joint federal partnership between the U.S. departments of Agriculture, Interior and Defense that aims to strengthen farms, ranches and forests while conserving habitat and natural resources and protecting vital training grounds for military installations. “This is an exciting designation and one that should help a lot of farm families in Eastern North Carolina remain on their land and continue farming,” Troxler said. “At the same time, it will help protect the beautiful and ecologically diverse natural resources along the coast and in the Sandhills, maintain forestlands and help maintain our state’s commitment to being one of the most military-friendly states in the country. Conservation programs will be announced in the coming months, and expected sources of funding include the N.C. Agricultural Development and Farmland Preservation Trust Fund, the Department of Defense Readiness and Environmental Protection Integration Program, the N.C. Wildlife Resources Commission, federal programs in the U.S. departments of Agriculture and Interior, the N.C. Working Lands Trust, and Food and Fuel for the Forces. The federal partners announced the North Carolina designation earlier today, along with designations for military installations in Florida and Texas. North Carolina is the first state to have multiple military branches, military installations and counties named as part of the designation. 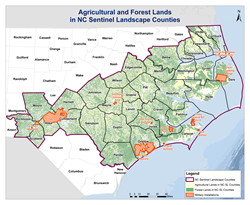 The counties included in the N.C. Sentinel Landscape are: Beaufort, Bertie, Camden, Carteret, Chowan, Craven, Cumberland, Currituck, Dare, Duplin, Edgecombe, Greene, Harnett, Hoke, Hyde, Johnston, Jones, Lenoir, Martin, Moore, Onslow, Pamlico, Pasquotank, Pender, Perquimans, Pitt, Richmond, Sampson, Scotland, Tyrrell, Washington, Wayne and Wilson. In addition to the N.C. Department of Agriculture and Consumer Services, a number of public and private agencies and organizations have worked together for several years as the N.C. Sentinel Landscape partnership to gain this designation, including Marine Corps Installations East, N.C. Farm Bureau Federation, N.C. State University, Environmental Defense Fund, N.C. State Grange, N.C. Forestry Association, N.C. departments of Environmental Quality, Natural and Cultural Resources, Military and Veterans Affairs, and Commerce, the N.C. Foundation for Soil and Water Conservation, local soil and water conservation districts, Clean Water Management Trust Fund, Texas A&M Institute of Renewable Natural Resources and many others.